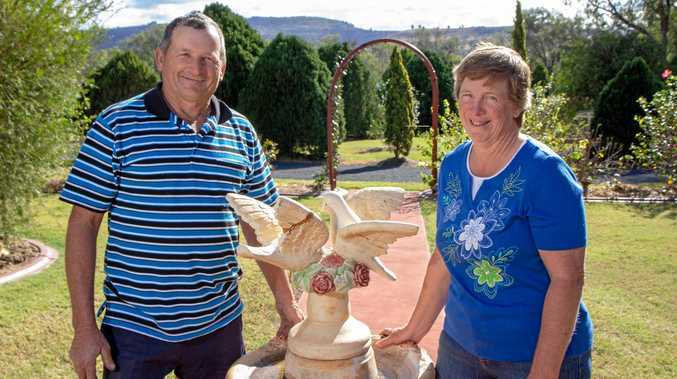 IT'S taken 12 years, but Lorelle and Trevor Niebling have finally taken out the grand champion prize in the Lockyer Valley garden competition. Mrs Niebling has been entering the competition since 2006, and while she's taken out plenty of category wins, the grand champion prize has always been just out of reach. "That was a bit of a fright,” Mrs Niebling said, having not expected the win. But with the garden the Nieblings have, it was only ever going to be a matter of time. Work on their planned masterpiece began almost immediately when the couple moved into their Blenheim property on New Year's Day, 2000. It utilises plenty of native and drought-tolerant plants, which keep maintenance and water usage low, Mrs Niebling explained. "It's got to be a garden where I put it in the ground and say 'look after yourself',” she said. The copious use of native and hardy plants has also helped the Nieblings' garden not only survive the dry, but also thrive. Colours still abound on the property, from the bright reds of the bottle-brushes beginning to bloom, through to the dark greens of the tall conifers that line the drive. Mrs Niebling's occasional application of water also helps keep the grass lovely and green - something she believed helped push her garden over the edge. Lockyer Valley Mayor Tanya Milligan said given the dry conditions, all entrants in this year's competition should be commended. "It's heartbreakingly dry and still, our committed gardeners have somehow managed to present outstanding gardens for judging,” Cr Milligan said. The Nieblings said the best tip for creating a gorgeous garden like theirs, was to determine the quality of both your soil and water and work with what you have. "And a lot of mulch,” Mrs Niebling added.